The Barbie Blog: We're back in business! I have a working sewing machine again! Yay! I am going to get to work on the Benny jacket this week and hopefully have a new post with pictures in the next week or so. 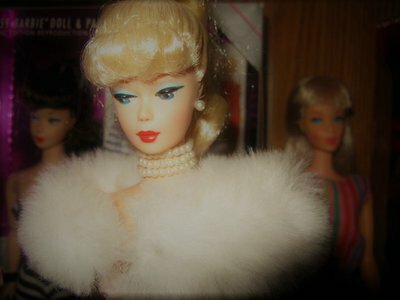 Do you readers have any projects that you are proud of for your dolls? See an outfit you want to try? Post them up in the comments! I'm glad your sewing machine is working again! Mine was out of commission for awhile, too -- apparently, the bobbin tension was off. I don't know why but I too love just making clothes. I'm not too great at it but I can usually do okay. I'm also a perfectionist so I work and work until I get it right. I had a little hiccup yesterday as I wasn't quite sure how to attach a sleeve. Thank goodness for youtube!!!! @barbielea, Your blue dresses are so so so cute! I'm glad you decided to make them all a little different. Such a perfect color for the SIS dolls. Where did you get the feather? @Saturday Sequins, such a perfect choice for Lagoona! She is very cute with the little mermaid costume. And the top is beautiful! Amazing job! Lol, that could have been so me, but I'm glad you didn't have to face a more serious problem with your machine. @ barbiebeauties: I love your dresses, they are lovely. The two with the lace details are my faves. @ Saturday Sequins: Lagoona is a cute little mermaid.